Welcome to the MarkMail team blog. Here we discuss MarkMail enhancements, new mailing list archives, and (perhaps most important) discuss the challenges of building an Internet service for searching large, million-message mailing list archives using XML, XQuery, and MarkLogic Server. As Google celebrates its 10 year anniversary we thought it'd be fun to use our archive of 30 million mailing list messages to see how Google's popularity has grown over time across the list-o-sphere. Boy has it grown! In 2008 (so far) the word "Google" appears in 1.4% of emails in our archive, up from 1.15% last year and 0.75% five years ago. While shockingly high, that 1.4% number is actually calculated with some conservative restrictions. We're excluding all mentions that occur inside quote blocks (where someone replies to another who said the word). It'd be 2% if we didn't have that rule. We're also excluding from our calculations all the Google Groups lists we follow, where Google is often the topic of discussion. With those lists added in? It's 13%. You can explore this yourself with our public interface. You'll want to query for "google", use the "opt:noquote" flag, and set "-list:googlegroups" to exclude those lists. Then you can add date constraints either by typing "date:2008" in the search or dragging on the chart. Track the numbers as a result of your searches, do a little division, and you get your percentages. 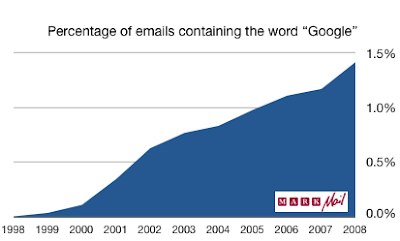 You'll see that so far in 2008 there were 50,826 emails saying "google" across 3,607,973 emails total. That's 1.4%. For 2003 it's 21,165 emails out of 2,770,480 total, or 0.75%.